For postcards prices please visit Flyers section. We offer standard 350gsm business cards in silk finish. Additionaly we can print your business cards with gloss or matt lamination. Glossy lamination gives to the business card extra shine, enhances colours and sharpness. Matt lamination gives elegant look and make them soft in touch. If you are interested in super-thick business cards don't miss our special range called Business Cards LUXE. Made of duplexed and triplexed stock, these business cards range from 540gsm to 700gsm. Extra thick, with hot foil elements are fantastic way of promoting yourself or your business. 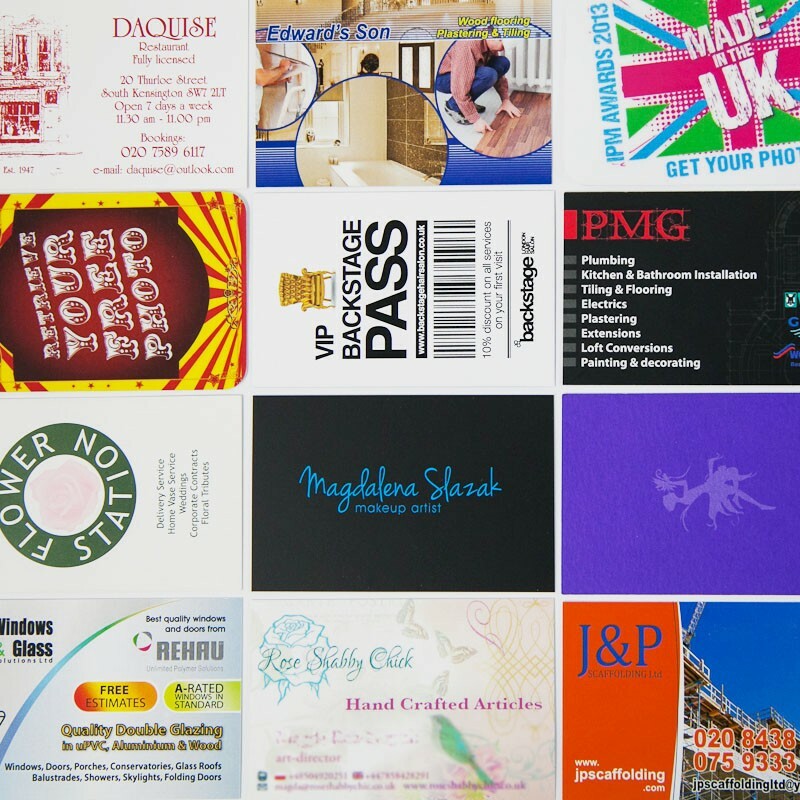 On orders up to 1000 business cards the turnaround time is usually 1-2 working days. For bigger amounts we need 4-6 working days, however there is an EXPRESS option available in many cases. Please contact us to check availability before placing an order. 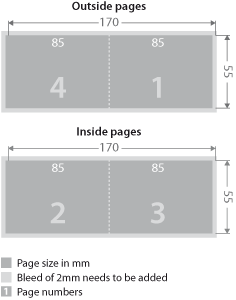 Standard business card size in the UK is 85x55mm - same size as a debit or credit card. We can also print your business cards according to custom requirements. Call us to discuss details. We require 2mm of bleed added to each side of the design. The final file size (including bleed) should be 89x59mm. Accepted file formats: PDF, PSD, TIF, EPS. We DO NOT accept open files e.g. In Design, Illustrator, Corel Draw, MS Word, Publisher etc. Please supply your files in CMYK colour space and Hi Resolution (between 300 and 600dpi). Postal delivery: FREE next day delivery via courier for orders above �50. We will do our best to print your business cards on-time. Every time! Call us on 020 8749 6055 or send a message. We would love to hear from you! We offer 350gsm folded business cards in silk finish. These can be folded along the short edge or a long edge depending on your requirements. Most often folded business cards would be used as loyalty cards, small price lists or gift vouchers. Additionaly we can print your business cards with gloss or matt lamination. Glossy lamination gives to the business card extra shine, enhances colours and sharpness. Matt lamination gives elegant look and make them soft in touch. On orders up to 500 business cards the turnaround time is usually 1-2 working days. For bigger amounts we need 4-6 working days, however there is an EXPRESS option available in many cases. Please contact us to check availability before placing an order. 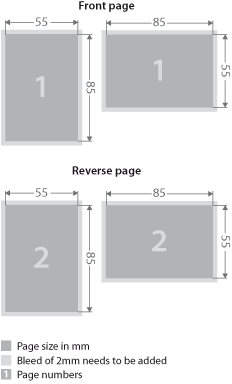 The standard size (when folded) is 85x55mm. We offer two kinds of folding landscape 170x55mm and portrait 110x85mm. We can also print folded business cards according to custom requirements. Call us to discuss details. We require 2mm of bleed added to each side of the design. The final file size (including bleed) should be 174x59mm for landscape and 114x89mm for portrait. We offer 400gsm business cards in silk finish and matt lamination both sides plus single sided gloss spot UV which adds shine and detail. If you are interested in super-thick business cards don't miss our special range called Business Cards LUXEE. Made of duplexed and triplexed stock, these business cards range from 540gsm to 700gsm. Extra thick, with hot foil elements are fantastic way of promoting yourself or your business. The turnaround time is usually 6-7 working days. Please supply your files in CMYK colour space and Hi Resolution (between 300 and 600dpi). Spot UV elements must be supplied in vector format; any text shapes to be spot-varnished must be converted to paths/outlines. UV elements should be placed on the separate layer or as a Pantone colour. 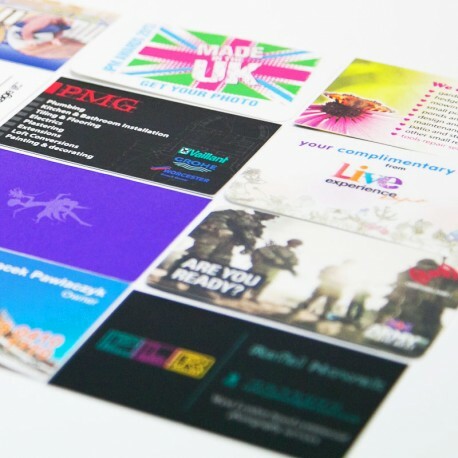 Additionaly we can print your business cards with gloss or matt lamination. Glossy lamination gives to the business card extra shine, enchances colours and sharpness. Matt lamination gives elegant look and make them soft in touch. We offer 400gsm business cards with matt lamination and single sided spot UV. Matt lamination gives elegant look and make them soft in touch while spot UV varnish adds shine and detail. We require 2mm of bleed added to each side of the design. The final file size (including bleed) should be 89x59mm. Spot UV elements must be supplied in vector format; any text shapes to be spot-varnished must be converted to paths/outlines. Please supply your files in CMYK colour space and Hi Resolution (between 300 and 600dpi) with the spot UV as a seperate layer or Pantone colour. You can download a set of blank templates here: "
We offer 300gsm business cards printed on Conqueror Wove card with a smooth finish, which gives them classic and distinctive look. On orders up to 1000 business cards the turnaround time is usually 1-3 working days. For bigger amounts we need 4-6 working days, however there is an EXPRESS option available in many cases. Please contact us to check availability before placing an order. We offer 300gsm business cards printed on Conqueror Laid card with a rough finish, which gives them classic and distinctive look. If you are interested in super-thick business cards don't miss our special range called Business Cards LUX. Made of duplexed and triplexed stock, these business cards range from 540gsm to 700gsm. Extra thick, with hot foil elements are fantastic way of promoting yourself or your business. The turnaround time is usually 5-7 working days. Please supply your files in CMYK colour space and Hi Resolution (between 300 and 600dpi). Spot UV elements must be supplied in vector format; any text shapes to be spot-varnished must be converted to paths/outlines. © 2015 CE Print Ltd. All rights reserved.